Deliver native Android, iOS, MacOS and Windows apps with a single shared C++ code base. Automatic, on the fly code generation to bridge common C++ code base to UI code written in Swift, Objective-C, Java, Python (more languages coming soon). Get the best of both worlds: single shared C++ code base and native UI on each platform. Bridge code automatically generated directly from C++ header files, no need to manually maintain separate IDL definitions or bindings. 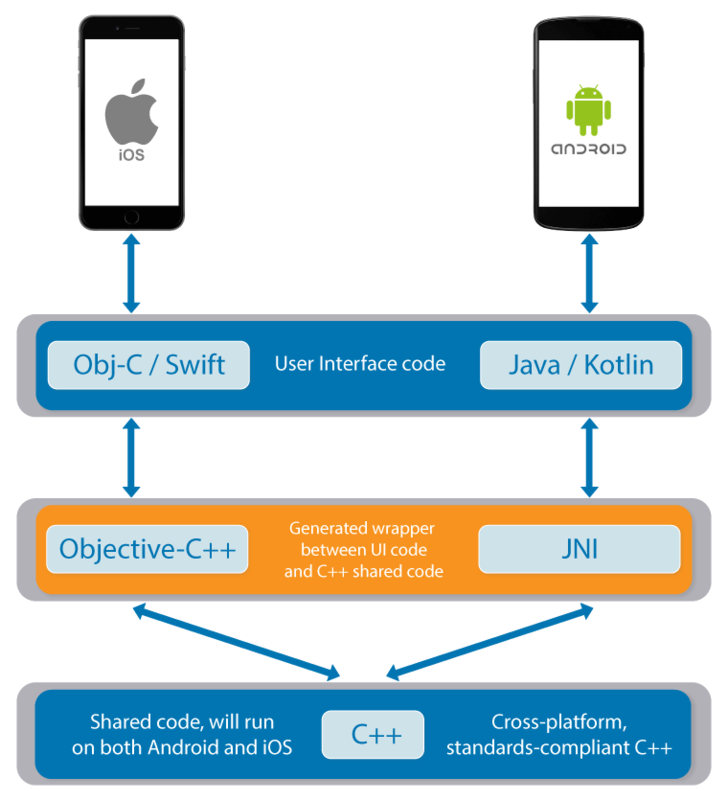 Share 90% of app code on all platforms using standards compliant cross-platform C++. Create native user interface for each platform using platform specific language (Swift, ObjC, Java, C++) with native UI frameworks and native UI controls for each platform. Native compiled C++ peformance on every platform. Convinient access to platform specific APIs from shared C++ code base. Develop on MacOS, Windows or Linux using any IDE with CMake support (Xcode, Android Studio, Visual Studio, etc.). A single shared C++ code base across all platforms dramatically reduces time and expense required to create and maintain an app for multiple platforms. Invest your resources in creating cross-platform, standard compliant C++ code - which you can easily leverage on any existing or future platform.